Improved Sports Baseball Cap is a modified baseball hat with a small opening designed to accommodate pulled-up hairstyles. 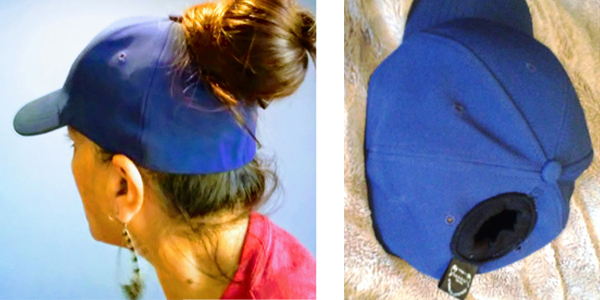 The rear portion of the cap features a cutout opening, allowing buns, ponytails, and other hairstyles to be worn without discomfort. When wearing a baseball cap, the user’s hair typically has to be pulled up underneath the cap or worn down in order for the cap to fit comfortably. Hats with a connection strap in the back can feature a small hole for hair to be pulled through; however, these hairstyles are often limited to a braid or ponytail. Some people may want to wear their hair pulled up, off the neck and out of the face. Wearing a cap and wearing a pulled-up hairstyle may be nearly impossible without excessive discomfort. Pulling and tugging on ponytailed hair still occurs when wearing an adjustable snapback or hook and loop fastener-adjustable hats. Improved Sports Baseball Cap is a stylish hat with a small aperture on the rear portion, allowing anyone with a ponytail, bun, shoulder length, or other types of long hairstyles to comfortably wear a hat. The hat includes an elastic band along the perimeter, allowing fit to be adjusted as needed. The hole enables hair to be pulled through the hat rather than compacted and stuffed underneath or hanging down onto the neck and shoulders. Individuals can wear the hat and pull their hairstyle conveniently through the aperture on the back of the hat. The hat allows users to participate in active outdoor activities while keeping hair up and out of the face. Individuals can wear numerous stylish hairstyles in conjunction with the hat. Improved Sports Baseball Cap can be constructed using nylon, polyester, and other commonly-used hat materials. The hat may be available in a standard size with the elastic band; however, sizes may vary to accommodate all user needs and preferences. Further, the hats can be available in numerous colors. Exact size, measurement, construction, and design specifications may vary upon manufacturing.